Resembling a primitive organism, the IC is one of the most basic of all chips - a "flip-flop," so-called because the introduction of a suitable pulse makes the chip "flip" into one electrical state until another pulse causes it to "flop" back to its original condition. Computers use flip-flops as counters. 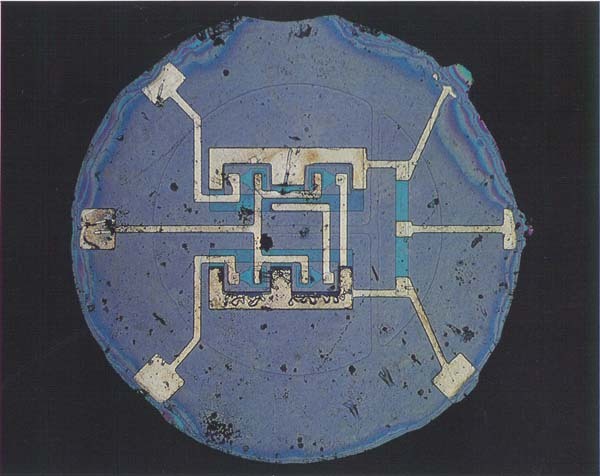 The chip has four bipolar transistors (the bright blue nose-cone-like features toward the center of the photo) and five resistors (the bright blue horizontal and vertical bars). The white bars are aluminum connectors, normally attached to the external world by wires (not shown here) soldered to the pads at the edge of the device. The irregular black specks are imperfections in the chip's surface. Actual size: 0.06 inches in diameter.